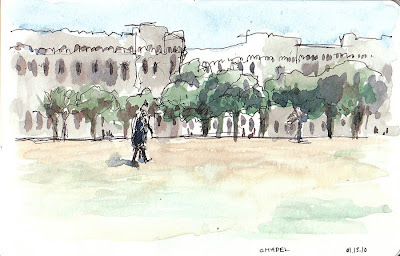 A quick sketch from the parade grounds at The Citadel Military College. Thanks for stopping by my blog, Dave! I'm lovin' this sketch. The colors, the depth. Great job! Dave, first let me say thanks for posting on my blog. I'm so pleased you did now I can enjoy your delightful sketches. You brought beauty to the everyday things we see.